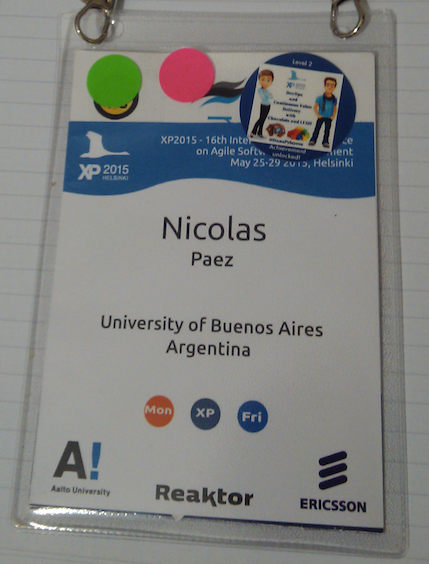 Como ya mencioné (y también resumí) estuve participando de la conferencia internacional de Extreme Programming: XP 2015. Esta conferencia tiene algunas particularidades que la distinguen bastante del resto de las conferencias sobre métodos ágiles. En primer lugar es la conferencia de Agile con mayor historia, este año fue la edición 16. Vaya curiosidad: la primer edición de la conferencia fue incluso antes de la publicación del manifiesto ágil. En segundo lugar es una conferencia con un fuerte involucramiento académico. En la organización de cada edición hay siempre una universidad anfitriona. Al mismo tiempo la conferencia ofrece tanto sesiones “industriales” (presentaciones informales) y sesiones académicas (presentaciones formales de papers de investigación). Durante mi participación en esta última edición tuve la oportunidad de hablar con algunos de los organizadores y conocer algunas cuestiones interesantes sobre la organización. Existe un steering committee que se encarga de asegurar la realización de la conferencia año tras año. Dicho steering committee está conformado principalmente por los chairs de las ediciones anteriores de la conferencia. La organización fue impecable. El centro de conferencias ofrecia unas instalaciones muy apropiadas para la dinámica del evento. Días antes de la conferencia recibí un mail con información muy útil para los extranjeros: medios de transporte para llegar al centro de conferencias, pronóstico del tiempo para los días del evento, información de contacto, y recomendaciones de vestimenta, entre otros. Adicionalmente como orador recibí otro mail con recomendaciones para preparar mi sesión. Cada sesión tenía un chair asignado a quien los oradores debíamos contactar previamente a nuestra sesión. El chair obviamente estaba presente durante todas sus sesiones para presentar a los distintos oradores, moderar las preguntas de los asistentes y asistir al orador en lo que este pudiera necesitar. La conferencia contaba con una app (android) oficial del evento que permitía acceder al programa de la conferencia, agendar sesiones, compartir mensajes entre los asistentes de la conferencia y también el envió de notificaciones de parte de la organización del evento. Si bien puede que algunas de estas cuestiones ya las haya visto en otras conferencias, la realidad es que esta vez (posiblemente por estar en un país totalmente desconocido y tan distante) me llamaron mucho más la atención. This was the last day of the conference and it was dedicated to workshops (academic and industrial**). I started the day in the Refactoring (academic) workshop and after coffee break I switch to the Retrospectives (industrial) Workshop by Paulo Caroli which was one of the best sessions I attended in the whole conference. Paulo shared many techniques to plan/guide retrospectives, many of them are documented in his book Fun Retrospectives. After the lunch it was the time to delivery my BDD Tutorial, a technical hands-on session where we reviewed the BDD technique and several implementation details with tools like Cucumber-JVM, Fitnesse and JBehave. Everything went as expected, no major issues with the technical stuff, all participant were able to run the Virtual machine I created for the tutorial. I am very happy with the results and I think I will plan to run it again in South America before the end of the year. ** academic workshop are basically presentation and discussions about formal research papers while industrial workshops are totally different, they are interactive sessions where the audience listen and do. As usual we started with the keynote, in this occasion by Brian Fitzgerald (Irish Software Engineering Research Centre). He talked about New directions for Software Development Process. He started with a summary of the evolution of software development process and after that he focused on the impact of Open Source movement and Crowd funding initiatives. After the keynote I attended to the Lightning talks session where I found some interesting presentations performed by Brazilian folks (Paulo Caroli and Rafaela Fontana). In the afternoon I attended to the testing track where I saw the most interesting sessions of the day: Llewellyn Falco talking about Getting Existing Code under Tests and Charlie Poole’ demo: From Test to Theories and back again. Excellent speakers and very useful information. 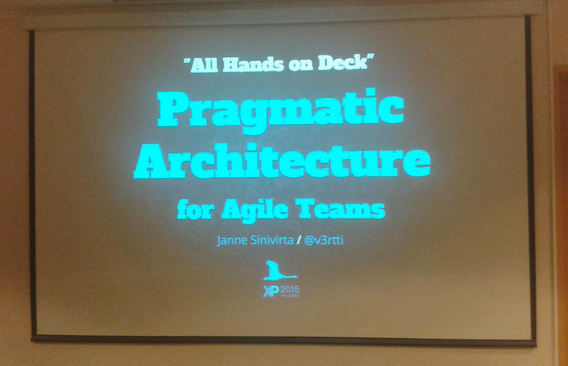 The last session I attended was Pragmatic Architecture for Agile Teams by Janne Sinivirta, it was fine, nothing new for me but it was a useful summary of key points. Finally at 5 PM it was the main conference closing (even when the next day there were some more workshops). As usual the closing included a retrospective activity, thanks to everyone and the announcement of the next year conference which will be held in Edinburgh. 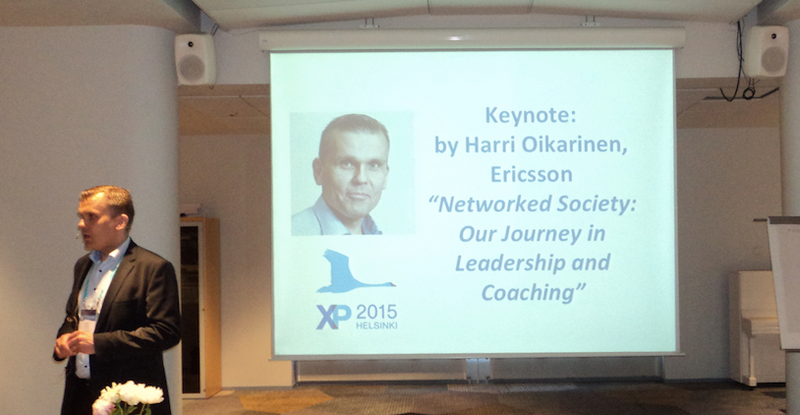 The journey started with the keynote by Harri Oikarinen from Ericsson. His talk focused on the leadership model and learning lifestyle strategy that Ericsson is using to face what he described as the Network Society. It was very interesting and the slides were really cool! After the keynote we had pitches of the sessions on the day. 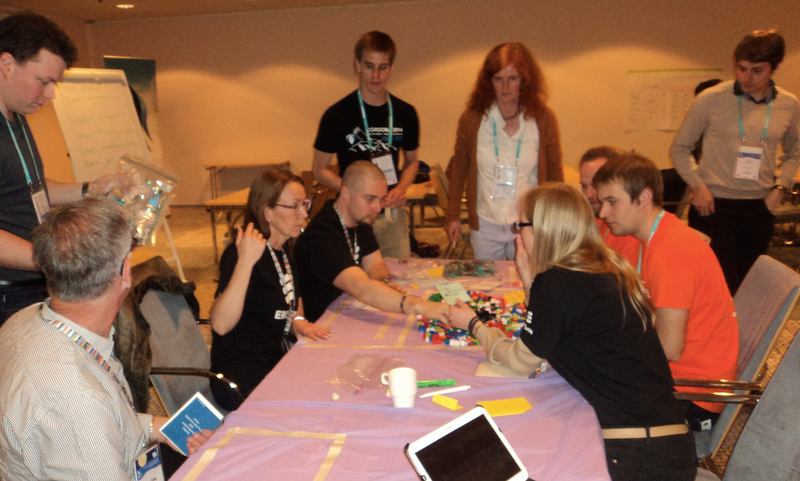 During the whole day there were open space sessions in parallel with the predefined sessions. I spent the rest of the morning in the lightning talks session where I found some interesting stuff and I also shared the Test-Driven approach we are using at FIUBA. After the lunch I joined the session Create the Conditions for Team Learning and Coordination: Five Simple Rules hosted by Diana Larsen. Very very useful (I will share some notes about this in another post). Finally I joined an open session session proposed by Alex Wilson which was about Modern XP. In this session we went over the original XP practices and analyzed the evolution of each of them. Very interesting and possible one of the best sessions of the day. Late in the evening we had the conference social dinner at the Helsinki Stock Exchange Building, a really nice place. The dinner was great: excellent food and some fun entertainment including PowerPoint-Karaoke (organized by Diana Larsen), a singer, a pianist and magician. I was in a table with some guys some India and Italy and another guy born in Tunisia but currently living now in Sweden. First of all I need to do a brief explanation of the conference layout. The main part of the conference takes place during Tuesday, Wednesday and Thursday. In addition to that, there are additional workshops on Monday and Friday. So on Tuesday was the conference opening. As expected it started with the welcome by Maria Paasivaara (general chair). After that, Janne Järvinen offer a brief presentation of the Need for Speed program. 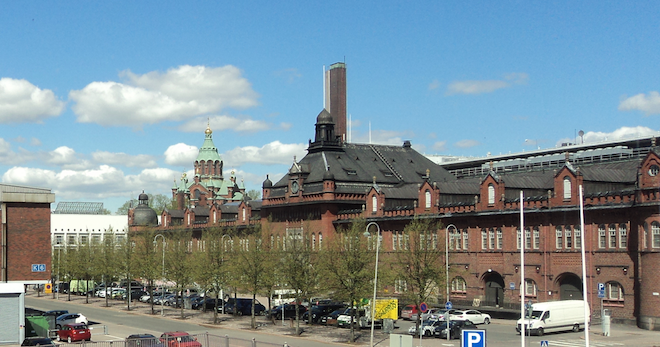 A program in Finland that aims to join students and industry. Next there was the keynote by Linda Rising who talked about Continuous Retrospective. The keynote was fine, I wrote down some resources to check. At the end of the keynote, every speaker of that day had 30 seconds to present his session and perform an invitation, good idea. The next session I attended was Why we need architects by Rebecca Wirfs-Brock. It was interesting but nothing new for me, so in the middle I switched to the session by Nitor guys who perform a technical demo of their tool Willow which provides support for elastic cloud deployments. I really liked it. 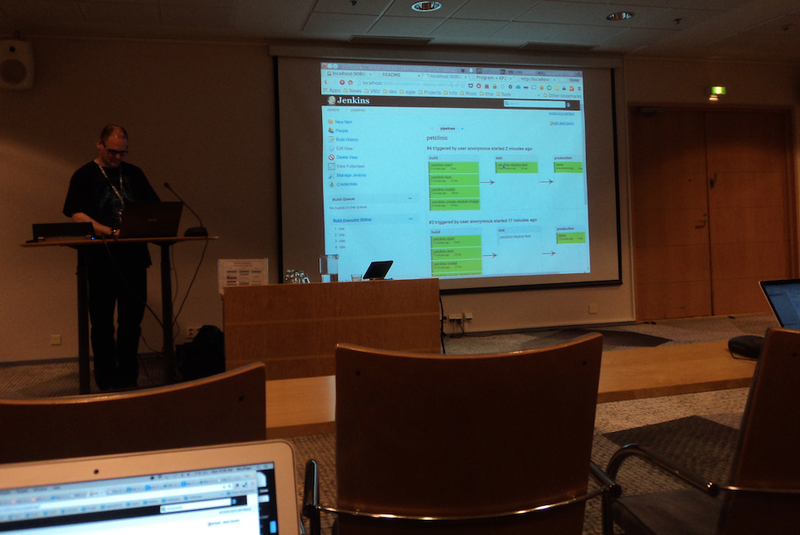 In the afternoon I attended to a Continuous Delivery session by Omenia guys, nice session. After that it was my first session: Continuous Delivery at Enterprise level with Jenkins and Octopush (the tool I developed with OLX guys). Everything went fine, the demo was successful but just in case I had prepared a short demonstration video. The slides are available here. The next session I attended was a panel about Continuous Delivery. I stayed there just 15 minutes and I left the room because to my surprise the debate was very poor. 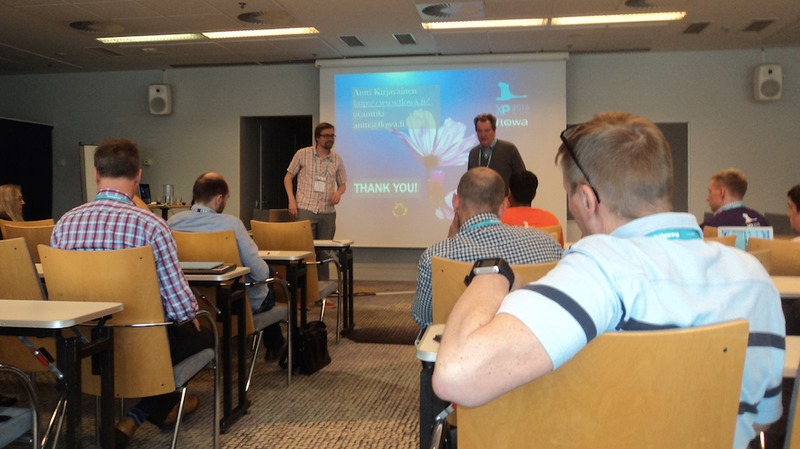 I moved to another session about contracts by Antti Kirjavainen which was much better. Finally we got to the best part of the day: the open space, yeah!!!! We had a marketplace to collect sessions for the three days. The facilitator was Charlie Poole and I liked his performance. After the marketplace we had like a cocktail and next to it the open space sessions started. 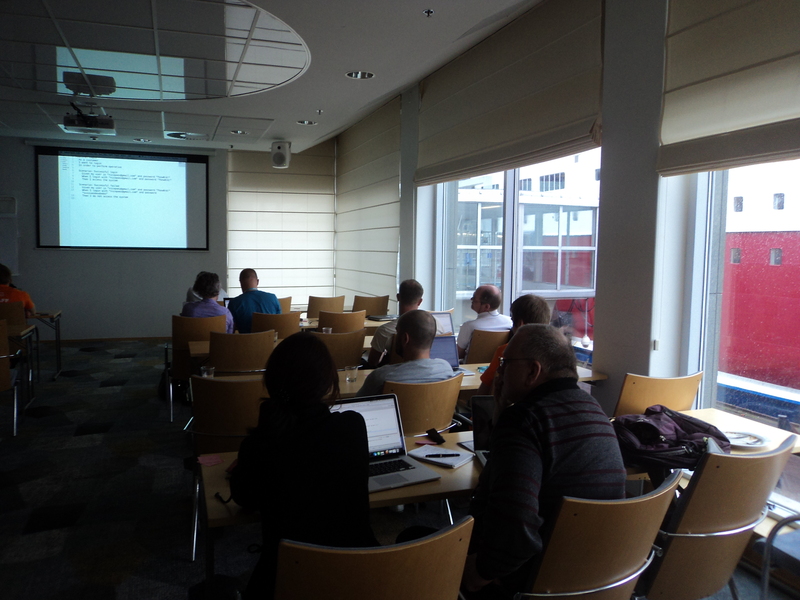 We had 3 hours from 19.00 to 22.00 with up to 7 parallel sessions. For me the best session was the one I proposed: Programming practices. The goal was simple: share ideas/practices/tips among programmers. Four person joined the session: Daniel (a coach from Germany), Sebastian (a developer/trainer from Sweden), Wouter (a consultant from Holland) and Oller (a tech lead from Sweden). For me it was a great session, I really enjoyed it. The first session I attended was a workshop by Wouter Lagerwaij: Continuous Delivery with Docker and Jenkins Job Builder. It was really really interesting, the speaker was an expert on the topic and the workshop’s materials were very properly prepared. I took several useful notes to review. When the workshop finished (on time, of course) we had lunch. The lunch was self-service and included salad, fish, potatoes, cheese and bread. After lunch there was also coffee and tea available. In the afternoon I had to choose between Fearless Change workshop by Linda Rising and DevOps and Continuous Value Delivery with Lego and Chocolate workshop by Dana Pylayeva. What do you think I choose? Yes, of course, the second one because is more related to the concerns I usually work. The workshop was fine, after brief conceptual introduction we worked in groups in an activity similar to El Pajarraco but with with a different focus: business value and team collaboration. I liked the activity and also the way Dana presented the DevOps theory. The last activity of the day was a reception at the City Hall where we shared some drinks and soft food. It was a nice networking activity were I met people from several countries including: Holland, Slovenia, USA, Spain, Sweden, Brazil and Finland of course.